1. In model editor when you try to rename pieces, the images disappear. Is this because the pieces no longer exist with the new names (because they are no longer in Accumark with those names)? 2. Is there a way to easily adjust the order in which pieces are listed in model editor? Ideally I would always like the pieces to be in numerical order based on their piece number but I find that sometimes one or 2 pieces will be out of order. 1. When you are renaming the piece you want to do this carefully. for example say I am naming a piece, I rename it but then decide I want to change the name again before it has been saved. The first rename of the piece doesn't really exist since it was never saved. So the image disappears. When this happens I just close the model without saving and start over. 2. You can cut and paste the rows until you have the correct order. Or I find it easier to select the pieces in AccuMark explorer holding the CTRL button and selecting in the order I want them to appear. 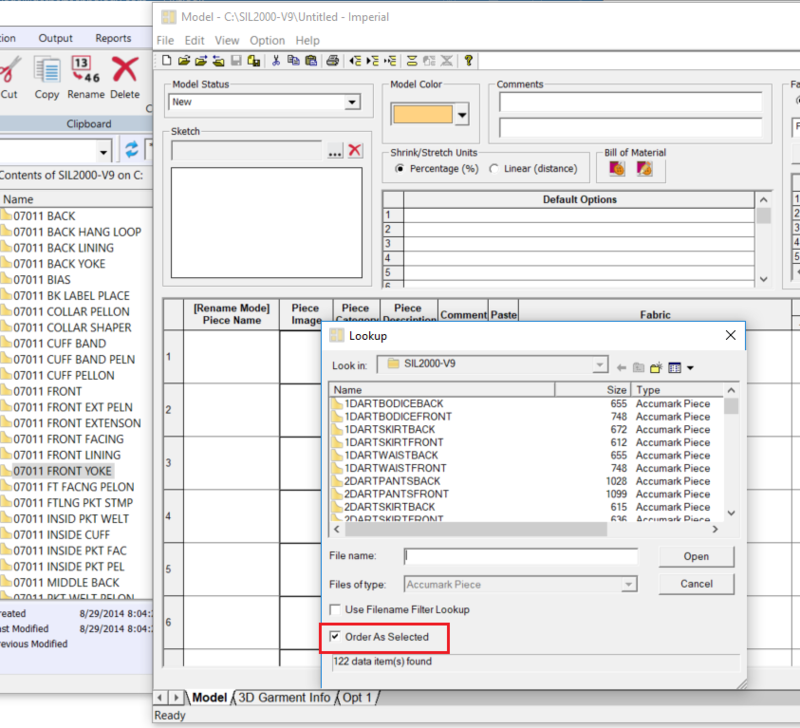 When you pick and choose them in Accumark explorer and right click to open in model editor they will appear in the order chosen. You can also select from the lookup in the order you want selected by checking the option "Order As Selected"
Just to add to Lisa's excellent response, make sure you have rename mode turned on when editing piece names in Model Editor. Simply right click into the header "Piece Name" and click the single check box for Rename Mode. In Model Editor, you can highlight a row by clicking on the row number (when you hover you should see a black, right facing arrow). Once selected move your mouse until the cursor changes to an arrow with a small box (this should happens as you approach the row border). Drag your mouse and you can easily drag and drop to reorder your model.